Thank you so much for all of your support. The Erie Optimists were able to help 41 families and 137 Erie kids have a magical Christmas. 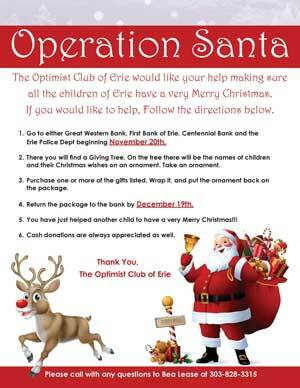 The Optimist Club of Erie would like your help making sure all the children of Erie have a very Merry Christmas. If you would like to help, follow the directions below. There you will find a Giving Tree. On the tree there will be the names of children and their Christmas wishes on an ornament. Take an ornament. Purchase one or more of the gifts listed. Wrap it, and put the ornament back on the package. You have just helped another child to have a very Merry Christmas!! Cash donations are always appreciated as well. You can use the donation form below. All donations from this page go directly to the Operation Santa program. If you have any questions please call Bea Lease at 303-828-3315 Thank you!